In this episode of Good Things Radio, Brooke and Jennifer expose some of their boys to their first war themed movie and share personal health struggles and tons more. This entry was posted in Podcast and tagged American Sniper, Boys, Military, Saints, War Movies, Women's Health on July 29, 2015 by brooketaylor. 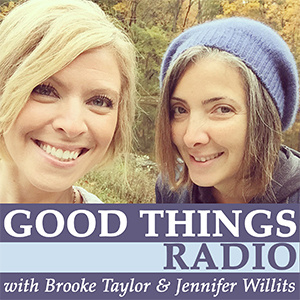 In this jam-packed episode of Good Things Radio, Brooke and Jennifer chicken out in more ways than one. Between kids and their addiction to screens, teens and their money, you’re sure to be entertained by their successes and failures in parenting this week. Brooke and Jennifer’s ongoing quest for physical fitness continues in some unusual ways and tons more. This entry was posted in Podcast and tagged Chicken, fitness, foreign exchange student, health, money, parenting, prayer, Prize Winner of Defiance Ohio, radio, Teenagers on July 10, 2015 by brooketaylor.